Workers have fought in wars. Workers have also opposed wars. On April 10 2017, we mark the 100th anniversary of the bloody battle of Vimy Ridge, where many workingmen died. 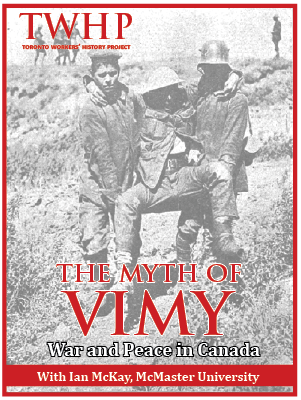 Some voices are urging us to commemorate that slaughter as a noble, heroic struggle that “forged our nation.” Ian McKay, one of Canada’s most respected historians, debunks that myth in The Vimy Trap, Or How We Learned to Stop Worrying and Love the Great War (a book he co-authored with Jamie Swift). He argues against using militarism to build patriotism. He reminds us how often Canadians preferred peace to war. He makes a loud, clear call to avoid glorifying war.